Below you will find examples of some of the daggers I have made. They can be either sharp for living history displays or blunt for combat. This is a Tudor left hand dagger with a hollow ground diamond section carbon steel blade, 12" long. 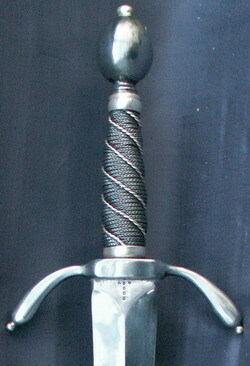 The hilt is iron and silver and the grip is twisted iron and silver wire with silver ferrules.